The table setting was straight out of Willy Wonka’s chocolate factory, laden with bowls of fine chocolate sprinkles, multi-colored discs of chocolate confectionary, cylinders of marsh-mellows, big round cookies, bits of sponge cake, tiny squares of tutti-frutti, fluffy icing cream and a huge bowl full-to-the-brim with molten chocolate. 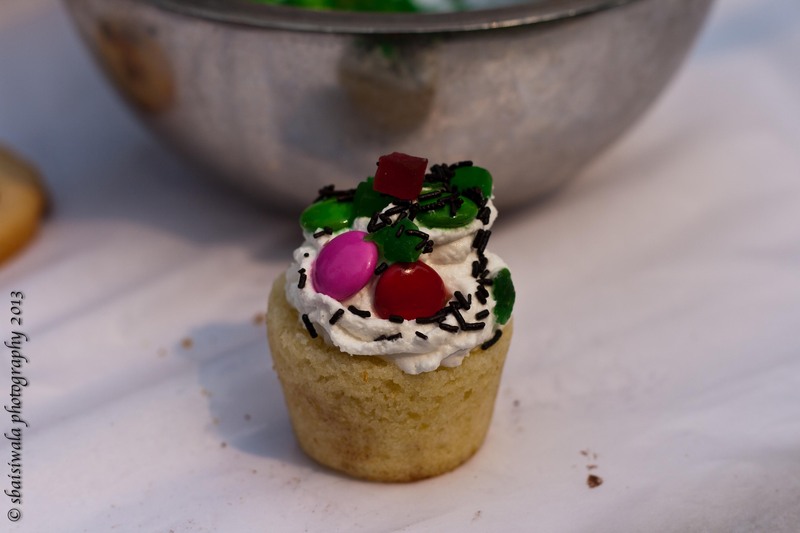 It was a veritable smorgasbord for any kid worth his/her sugar, er… salt! 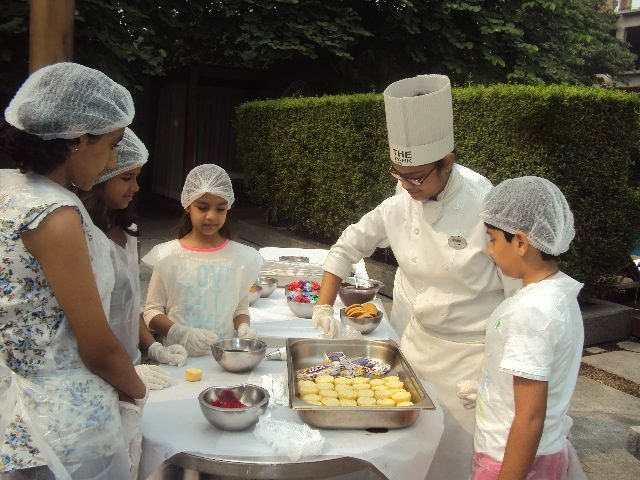 This was a table setup done especially for the children who had accompanied their moms to the Annual Christmas Cake Mixing event at The Park Hotel, New Delhi. 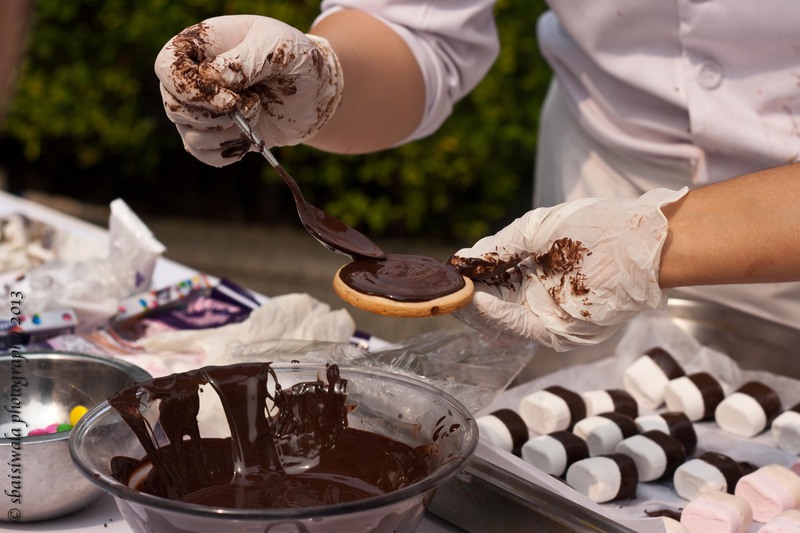 Usually organized as a fun activity for the staff, The Park decided to collaborate with CaL and invited 20 Mommy Chefs to partake in the do. 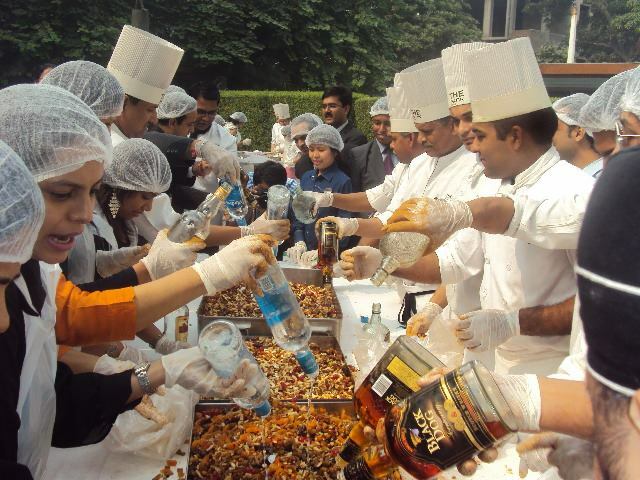 The event is a prelude to the traditional Christmas cake that is a delicious cornucopia of dry fruits, alcohol and warm spices – not to forget the ubiquitous cake mix. 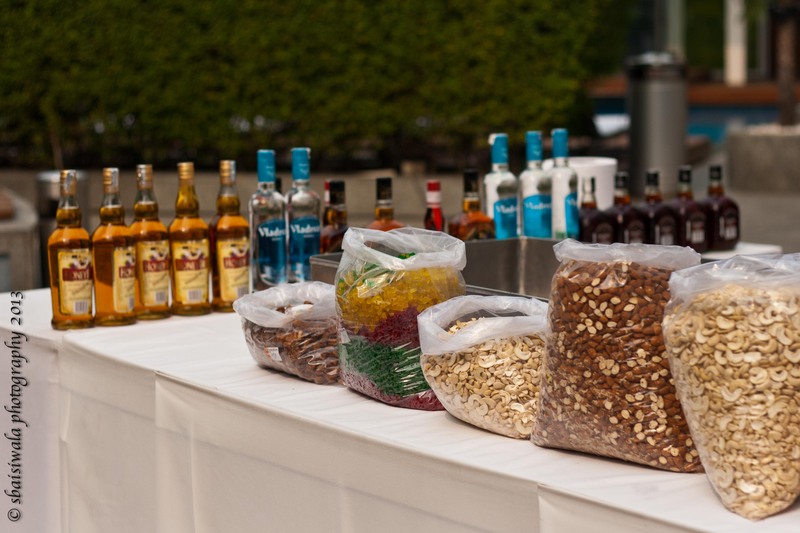 The idea is to get everyone involved in mixing sacks full of dry fruits (cashew nuts, almonds, raisins, dates, apricots,) candied peels (ginger, orange, citrus), powdered warm spices (nutmeg, cardamom, cloves, cinnamon), brown sugar and loads of alcohol (rum, brandy, vodka, whiskey). This concoction is then “brewed” for over a month and finally added to the cake mix and baked. The onlookers gazing longingly at the table! 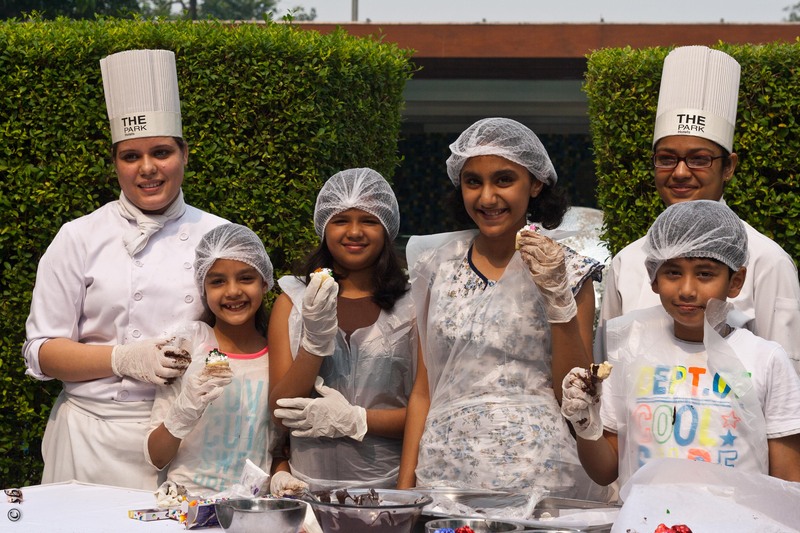 The budding junior chefs were kitted out in aprons and caps and asked to vent out their creativity on the cookies and sponge cake bits with the variety of sprinkles for decorations. Two chefs attended to the tiny tots and helpfully piped the cream as and when directed. The enthusiasm and delight with which the kids participated was evident in the telltale smears on their lips. I am sure the sampling was done to ensure a perfect taste to their creations! Picture courtesy The ParkThe mommies were also ensconced head-to-toe in protective gear of gauze cap, plastic apron and some gloves and then let loose onto the mixing table. First all the sacks were emptied in the 4-5 large baking trays and all the dry fruits were mixed thoroughly. To our surprise, we found some coins (1 & 2 rupee) were added in to the mix. These are “good-luck” bits, explained one of the chefs while offering that we hold onto one each for ourselves. 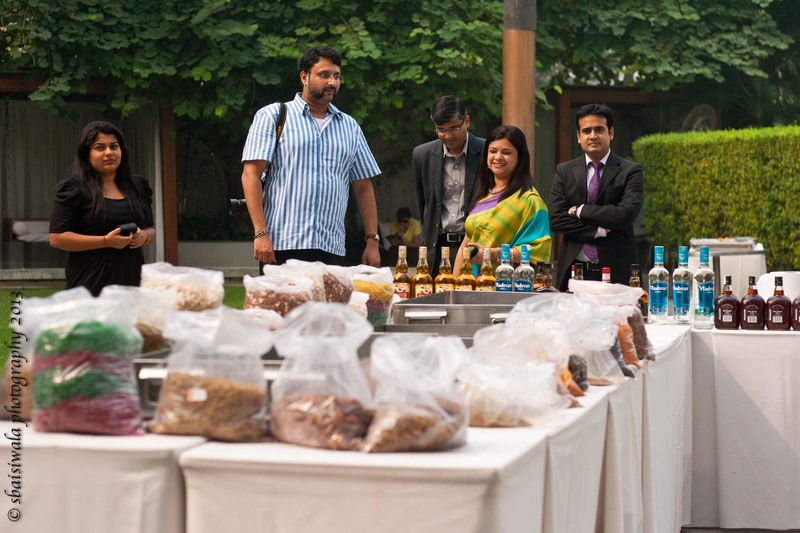 Then came the spices with their overwhelming aromas, prompting someone to comment that it smelt all warm and wintery here! And the best was saved for last – the ambrosia! Most of us got a bottle each to tip in which we did with great gusto. Reeling back when the fumes hit us, the mixing proved to be a therapeutic and decadent experience for all of us. Laughing and cheering, we moved on from the mixing table for a group picture. 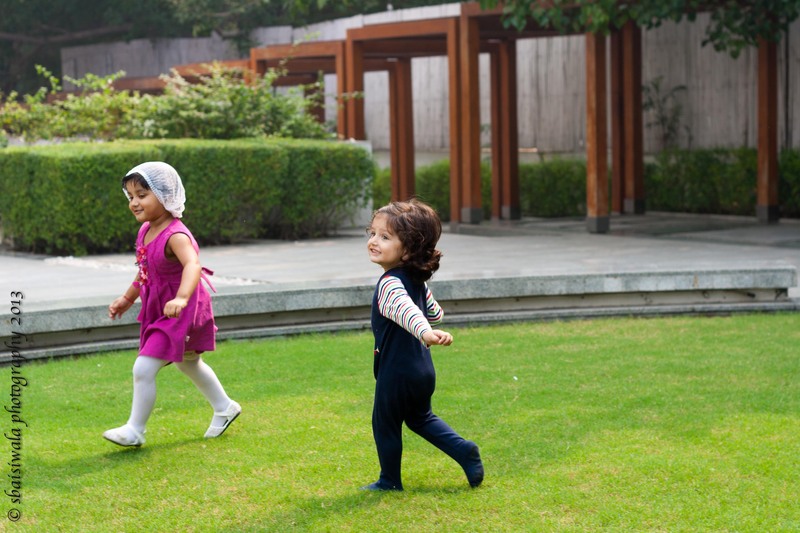 The ones who enjoyed this the most were definitely the kids who could be seen gamboling onto the green patch and the cabanas by the side with great abandon while the parents relaxed with their cuppas of hot tea/coffee and snacks – all served with such warm smiles by the hotel staff. 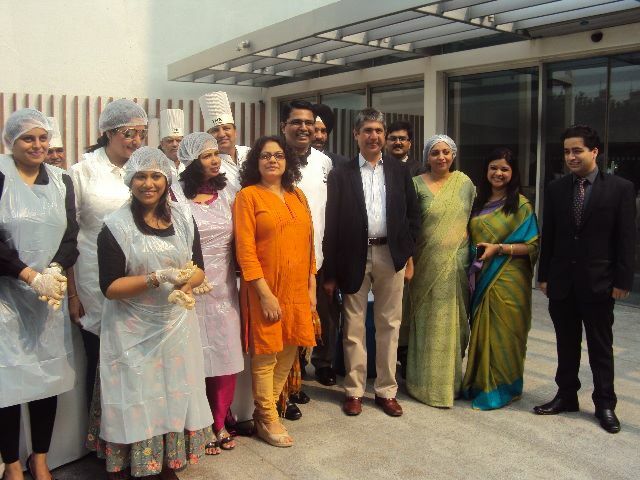 It was heartening to see a hospitality giant open its doors and provide such a joyful experience. 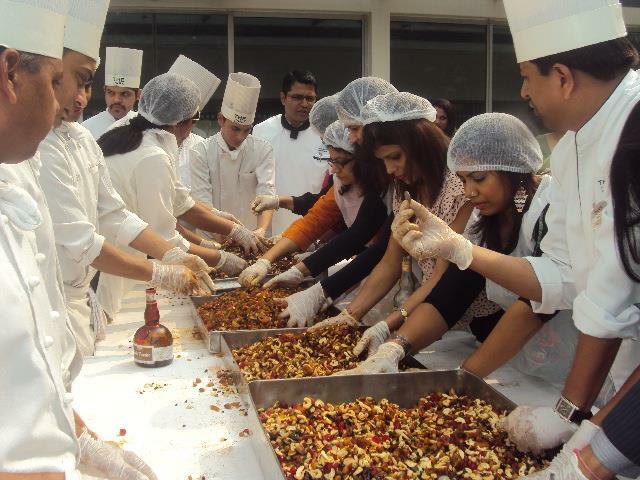 The bonhomie and camaraderie of the staff while engaging in this activity was simply a delight to behold. Now, I am waiting anxiously for an invite to the final cake tasting. After all we need to check how good a job we did with this – anyone listening?! CaL? The Park?! Previous Post Dastkar – Go Green!! Next Post Pushkar – a foodie haven! !